Good Lord, this looks delicious! 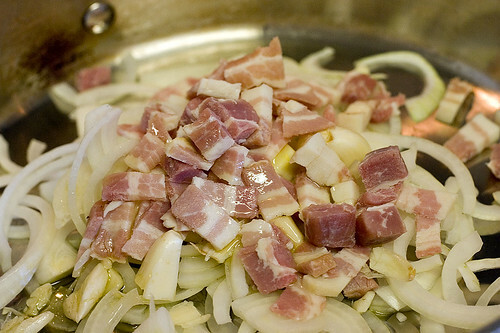 I have some pancetta, I think I’ll use that. Maybe for breakfast with an egg on top. I don’t see how people do Atkins either. Mmm, that looks delish. Just wondering though, where does the stock come in? I guess you pour it over before putting it in the oven? 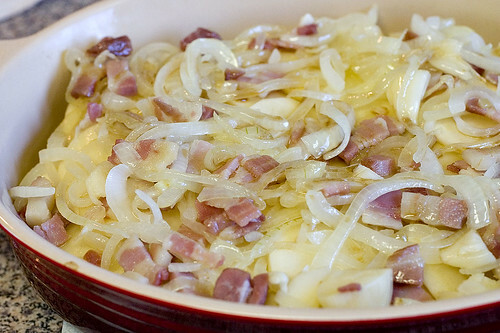 PJ – Pancetta would probably work well in this recipe also; doubly so if it was homemade. The egg would work but you’d probably want to cook it separately. It would probably overcook in the oven. Kevin – It is pretty tasty. Zo – Trust me to screw up writing up a simple recipe. 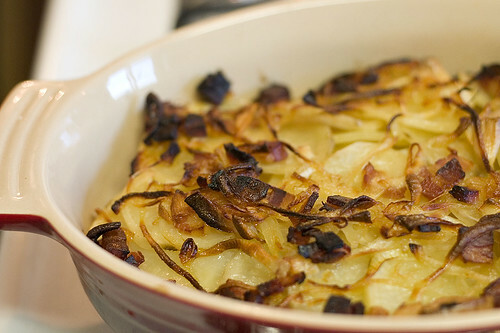 You drizzle the stock over the gratin before it goes in the oven. I’ve corrected the recipe above.